Alongside the Guardians of the Galaxy Vol. 2 Special event, TinyCo has also dropped another crate into our shops - the Ravager Cargo Crate! 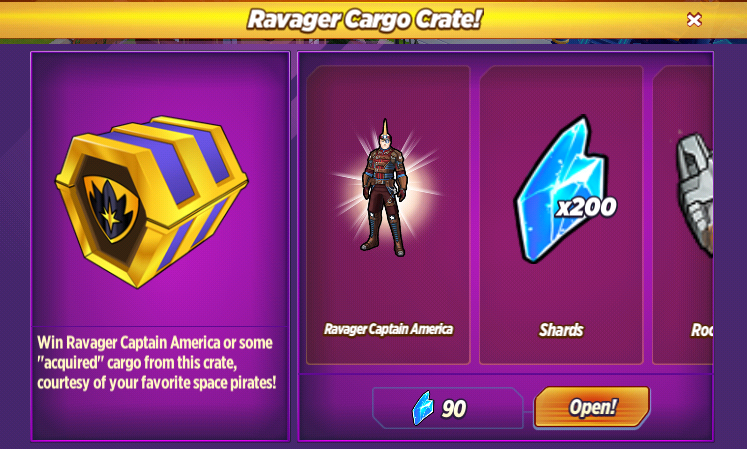 It costs 90 Shards per try and contains Ravager Captain America and other useful items for the event. Yondu: Man! I had my doubts, but you make this look good! Yondu: Cuz I run a mutinous crew of thugs n' scumbags, and you're the only man in the galaxy that can whip 'em into shape! I'd do it myself, but don't nobody wanna mop up all that blood. Yondu: And you'll immediately win 'em over with that sweet hawk n' eye-thingie! You went from a square pretty boy to a real sleazebag Ravager! Ravager Captain America: Thanks, Yondu. That means a lot coming from you. Yondu: Give 'em hell, Captain! And please be gentle with my crystalline trinkets! Ravager Captain America: I can't lead the Ravagers if I don't become one. Iron Man: Nope. Still speechless. Ravager Captain America: I'll wear this more often. Are you going to have a go at the crate? If you did, did you get what you wanted?